Tella Holloway is losing it. Her brother is sick, and when a dozen doctors can’t determine what’s wrong, her parents decide to move to Montana for the fresh air. She’s lost her friends, her parents are driving her crazy, her brother is dying—and she’s helpless to change anything. Until she receives mysterious instructions on how to become a Contender in the Brimstone Bleed. It’s an epic race across jungle, desert, ocean, and mountain that could win her the prize she desperately desires: the Cure for her brother’s illness. But all the Contenders are after the Cure for people they love, and there’s no guarantee that Tella (or any of them) will survive the race. The jungle is terrifying, the clock is ticking, and Tella knows she can’t trust the allies she makes. And one big question emerges: Why have so many fallen sick in the first place? From the blurb, “The Hunger Games” parallels were already secured, though at least I didn’t see anything saying “For fans of…” or I might have eaten my shoe. We are straight away introduced to Tella, who is a very conscious of her looks, especially her main of brown curly hair. In fact, she is a very ignorant, bratty, spoiled girl and; at least initially, is a hard to read character, she just wants to make you throttle her. She finds a strange blue box on her bed, believing it to either be a present or a prank from her dying brother, she inserts the earpiece, and is swiftly interrupted by her Dad. She is horribly outraged, angry and stroppy that her Dad took away HER present. This to me is the point where Tella became very annoying, she is plotting against her parents, how to get this item back, even though all signs point to this not being a good idea. She eventually get this ear piece and is invited to the “Brimstone Bleed” but first must pick her companion. She picks a cracked egg that smells, but she has one. 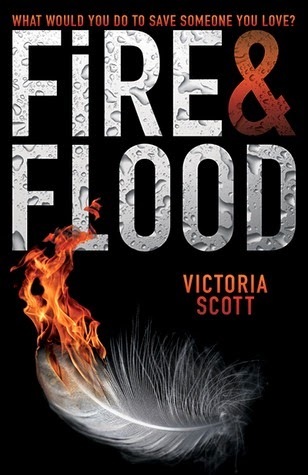 Victoria Scott has made Tella a very dislikeable character and this made it very hard for the reader to connect to her. It is a shame the Scott decided to go down this route of only one victor, race against time etc. My next issue? The genetically made companions. They are like Pokémon meets the “dæmons” from His Dark Materials. They are genetically made creatures who’s sole purpose is to look after their companions. They all have different traits, whether fire breathing, or water producing etc. Typically Scott gave Tella the most coveted one. A shape-shifter. We also have a love-interest and an enemy. A mysterious Guy, who seems to have knowledge of the Brimstone Bleed, and an arrogant, companion abusing collector. The mysterious Guy, helped Tella find her egg, let her follow him and finally they cultivate their interest in each other. Forgetting that they are there for the “Cure” for a loved one. The enemy, is very antagonistic, and it is clear from the first meeting that he has an interest in Tella and her Companion. He will make his move on them later on in the second ecosystem. Scott does create an interesting world, and although her character building can be somewhat annoying or even lacking, she includes many twists and formations of groups. Sometimes throughout this book it can be a little bloody she does successfully create relationships within the groups and the story itself looks to be promising. It does intrigue me in such a way that i would pick up the next one. A solid 3/5 read.